Ben Hall, 29, of Gain Lane, Bradford, was fined £100 for possession of cannabis in Gale Lane, Harrogate. He was ordered to pay a victim surcharge of £30 and costs of £85. Magistrates ordered that the drug be forfeited and destroyed. Ioan Nistor, 48, of no fixed address, was given an eight-week prison sentence suspended for 12 months for failing to provide a specimen of breath at Harrogate Police Station when suspected of committing a driving offence. He was ordered to pay a victim surcharge of £115 and was disqualified from driving for 30 months. Victoria Selina Firth, 47, of Iveson Garth, Leeds, was given a 12-month community order for stealing property including meat and alcohol worth £250 from Marks and Spencer in Leeds Road, Harrogate, clothing worth £200 from Next at St James Retail Park, Knaresborough, and clothing worth £250 from Boots at the same retail park. She was made subject to a three-week curfew and was ordered to complete six months’ treatment for drug dependency. She was ordered to pay a victim surcharge of £85 and costs of £85. Sara Elizabeth Lincoln, 23, of Fremington, Richmond, was fined £150 for being drunk and disorderly in West Park, Harrogate. She was ordered to pay a victim surcharge of £30 and costs of £85. James Lee McGlinchey, 28, of Ashfield Close, Pateley Bridge, was given a 12-week prison sentence suspended for 24 months for sending text and photo messages to a woman in breach of a restraining order. He was ordered to complete a Building Better Relationships programme and to pay a victim surcharge of £115 and costs of £85. 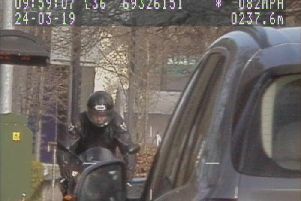 Reagan Alexander Robert Nash, 18, of Slingsby Crescent, Harrogate, was fined £180 for riding a motorbike on Cheltenham Parade while under the influence of alcohol. He was ordered to pay a victim surcharge of £30 and costs of £85, and was disqualified from driving for 14 months, to be reduced by 14 weeks on completion of an approved course. No separate penalty was imposed for riding a motorbike without a valid licence. Mark James Pickersgill, 42, of Mickley Village, Ripon, was fined £180 for driving while under the influence of alcohol on New Road, North Stainley. He was ordered to pay a victim surcharge of £30 and costs of £85, and was disqualified from driving for 22 months, to be reduced by 22 weeks on completion of an approved course. Carl Ingles, 38, of Hoyle Avenue, Lytham St Anne’s, Blackpool, was given an 18-month community order for twice assaulting a woman by beating her, once in Harrogate and once in Knaresborough, damaging a fridge-freezer and a mobile phone belonging to the woman, and damaging an ornament worth £470 belonging to the Crown Inn, Knaresborough. He was ordered to complete 300 hours of unpaid work and to pay compensation of £80 for the fridge-freezer and phone, £100 for the ornament, and two amounts of £100 each for the assaults. He was made subject to a restraining order preventing him from contacting the victim. Nigel David Green, 37, of Bilton Close, Harrogate, was ordered to serve a total of 14 weeks in prison after coming before the court to face new charges following two convictions in January. He had stolen products worth £739 and £1,327.98 from Boots in Cambridge Street on two separate occasions, as well as meat worth £64.75 from the Co-op in Leeds Road. The offences were carried out while he was subject to a conditional discharge for possession of class B drugs, burglary, three attempted thefts and four thefts, and a community order for 17 counts of theft, one of possession of class A drugs, harassment, and failing to answer bail. The community order and conditional discharge were revoked, and he was ordered to pay a victim surcharge of £115. William Allan Rutherford, 19, of Knaresborough Road, Harrogate, was given a one-year conditional discharge for damaging a radiator and an internal door belonging to a woman, and destroying a laminated sign at Harrogate Police Station. He was ordered to pay a victim surcharge of £20. Stuart James Harrison, 41, of Timble Grove, Harrogate, was given a 12-month community order for damaging tarmac belonging to another man, which the court found was racially aggravated. He was ordered to complete eight hours of unpaid work, and to pay costs of £200 and a victim surcharge of £85. Danielle Marie White, 32, of no fixed address, was fined £150 for driving while under the influence of alcohol on High Street, Pateley Bridge. She was ordered to pay a victim surcharge of £30 and costs of £150, and was disqualified from driving for 22 months, to be reduced by 22 weeks on completion of an approved course. She was fined a further £30 for failing to surrender to custody.